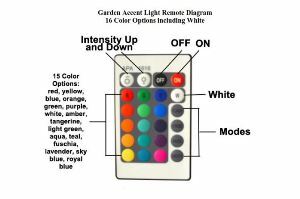 New 16 color Garden Accent Outdoor Landscape Light adds a Rainbow of Colors to your Yard! New 16 color Garden Accent Outdoor Landscape Light adds a Rainbow of Colors to your Yard! The BlissLights Rainbow Garden Accent Light will paint your outdoor landscaping with colors, turning an ordinary yard by day into an enchanting wonderland at night. 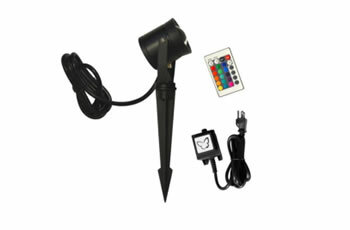 The garden light comes with a 12V-12W transformer, remote and stake making it easy to set up. Just push it into the ground where you'd like to place it and plug it into an outdoor outlet. The Rainbow Garden Accent Light can also be adapted to an existing 12V transformer system.